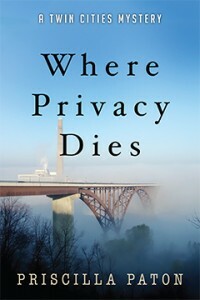 Where Privacy Dies ($15.95, 252 pages, 6×9 Trade paperback, ISBN: 978-1-60381-665-6), is the first book in a cozy mystery series by Priscilla Paton. When the photo of a little girl is found on an executive’s corpse, Detective Erik Jansson and his new partner, Detective Deb Metzger, delve into a world of lying informants and deadly secrets in order to uncover the truth about the girl’s identity. An executive’s corpse is discovered in a Minneapolis wetland, and with it the photo of a girl. Is she unconscious or dead? Detective Erik Jansson takes on the investigation and is mismatched with a new partner, the imposing Detective Deb Metzger. They soon learn that the murdered man worked for a reputation management firm that serves wealthy clients. Other employees from the firm have also vanished, but information is withheld from the detectives by a corporate cover-up. Erik and Deb pursue promising leads about the identity of the photo girl. When these leads take them to a down-and-out family and a Northwoods cabin, they seem to be dead-ends—or are they? Despite informants who lie, the online targeting of another girl, and threats to their own safety, Erik and Deb delve deeper. The story becomes stranger and more unsavory as intensely private and deadly secrets come to light. Book One in A Twin Cities Mystery series. Priscilla Paton grew up on a dairy farm in Maine. She received a B.A. from Bowdoin College and a Ph.D. in English Literature from Boston College. A former college professor, she has taught in Kansas, Texas, Florida, Ohio, and Minnesota. She has previously published a children’s book, Howard and the Sitter Surprise, and a book on Robert Frost and Andrew Wyeth, Abandoned New England. She married into the Midwest and lives with her husband in Northfield, Minnesota. When not writing, she participates in community advocacy and literacy programs, takes photos of birds, and contemplates (fictional) murder. For more information, go here. Death is private. A person can die in front of a video camera, collapse in a massacre, pass surrounded by family, yet only one being crosses that final line of consciousness. Solitude follows, a remembered saying—the grave’s a fine and private place. It was Detective Erik Jansson’s duty to violate that privacy and it weighed on him as he knelt by the crude dirt mound covered with branches. The mound, in the flood zone of the Minnesota River, had been obscured by the scrub of the wildlife refuge. The perfect place for final rest. Perfect and perfectly wrong. The ascending roar of a silver and red plane leaving the nearby Minneapolis/ St. Paul airport disrupted Erik’s contemplation. He lost the train of dark thoughts he’d summoned to shut out the temptation of the sunny morning to run and kayak and breathe. A gorgeous morning, the second Sunday in April. The landscape was greening, and robins threw outsized energy into their chirrupy defense of territory. Erik pushed a hand through his dark hair to discharge his own energy, but restlessness will out. What had happened? Who dumped a body so unlovingly? Why? Was there more bad to come? There usually was. He studied the mound again, and the tweed-sleeved elbow uncovered to confirm the find of the cadaver dogs. Then he straightened to stretch his long legs and rub his arms, the morning being brisk for his department fleece. Waiting on the bank above him were the discoverers of the scene, an odd-sock trio—a boy about twelve in a stained jacket with a dirt-bike quite authentically dirty, and a retired couple outfitted as khaki twins with binoculars clutched to their chests. Behind them stood a uniformed officer. Erik looked past the group toward the refuge entry to trace possible routes to this spot. You could hike down the steep trail behind the airport hotels, as the couple had probably done. An unpaved road for bikes and service vehicles took a less dramatic downhill path to merge with the broad trail where the marsh grasses began. Then the trail ran along backwater banks lined with cottonwoods, alders, maples, and oaks. A four-wheel drive vehicle could navigate that route easily. From trailside, it’s a six-foot drop down to the narrow flood zone where Erik stood by the mound. Easier to prepare that grave if more than one person had been hurrying the body along on its journey.